Pretty outstanding dram, especially considering it's only 4 years old. The port finish is phenomenal. It complements the dram, it doesn't dominate it. 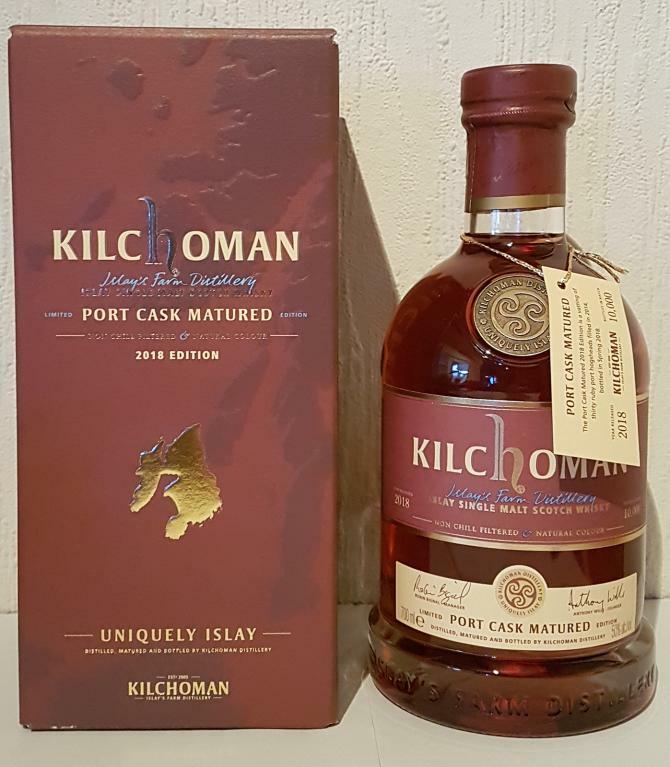 As with all drams I tasted by them, Kilchoman does not fail to impress! 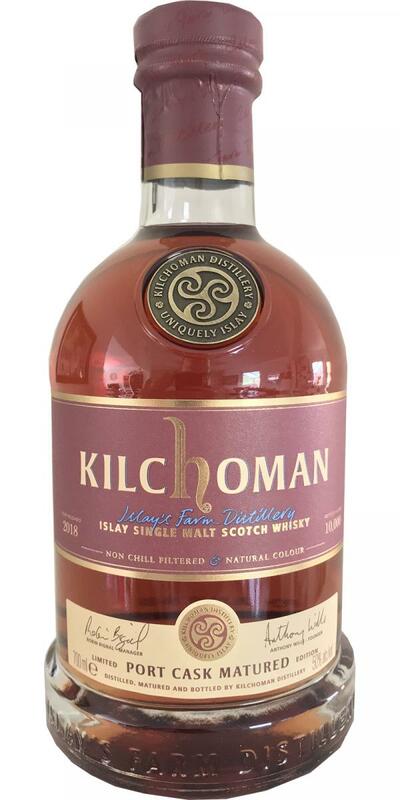 First off, that typical Kilchoman farm-y earthiness and peat combined with fresh red fruit. A little alcohol on the nose, and some very interesting citrus notes. Some fresh tobacco and a faint hint of mint. Very bold red fruit and citrus notes with pepper, smoke and vanilla. With some added water the mouthfeel becomes very creamy and oily, which is definitely a plus. Long and spicy. Definitely some mint in the finish, together with cooked red fruit, and again some vanilla tobacco. The taste that lingers is dark, sweet and smoky. Red fruit with citrus notes. Earthy peat and smoke. Hints of creamy sweetness. Red-berries jelly/marmalade. with spicy notes, citrus sweetness and maritieme notes. Long and strong. With cooked red-fruit, vanilla and peaty notes. 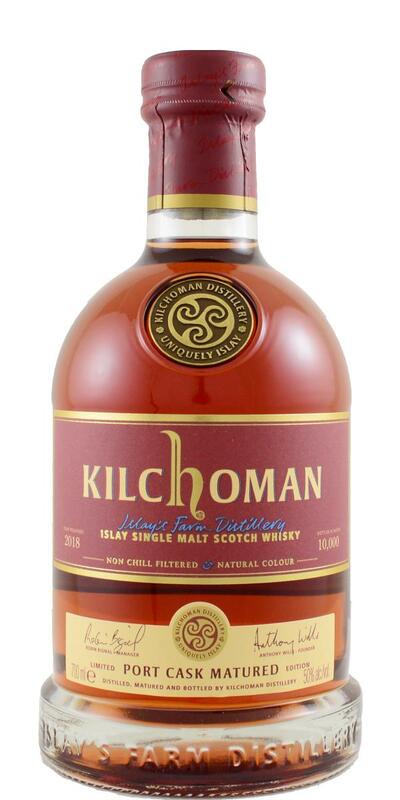 Quite interesting Islay malt, rather pleasant and smooth as for 4-year-old whisky. Easy going but nothing really special. Sort of a weird combination of nose but the palate wasn’t too bad. Wild Berries Pastille Candies? Wet peat, thin layer of port sweetness. Vanilla malt. A juvenile nose, with moist peat. It works a bit nasty, on bacon and rotting plants (yet it isn't as bad as that sounds). There is a mild sea breeze in the nose, and further oak, vanilla, and a combination of lemon and strawberries. The taste: medium to full-bodied, rather saline/briny with moist peat, wood, bacon, and still a rather odd combination of lemon and strawberry: sour strawberries? Finish: medium, and quit acidic. The combination of lemon and strawberry puzzles the mind. It's not the best combination, especially if it's mixed with dirty, saline peat and plain wood.